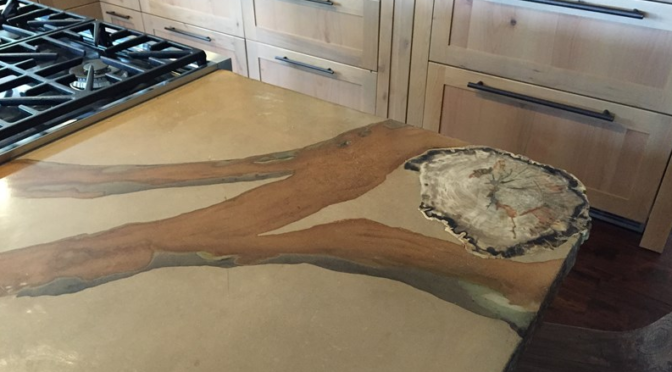 Concrete stains are the perfect way to achieve a one-of-a-kind decorative effect on countertops. For both interior and exterior surfaces, stain offers an infinite array of colors, as well as special effects. If you want new countertops installed in your kitchen, bathroom, or even an outdoor kitchen on your patio, stain is an excellent way to create a unique color and pattern. Instead of being opaque and solid, like paint, concrete stains are formulated to permeate the concrete and infuse into the porous material. The result is a deep, rich, translucent tone that is stunning. For an even more distinctive aesthetic, stains can be mottled, antiqued, and variegated. The most common way to create a one-of-a-kind look is with color. Although you can choose a single color, a skilled contractor can incorporate multiple colors for a spectacular countertop design. With concrete stains, you have basically two choices, water and acid based. For acid-based stains,you are limited to certain color choices, whereas with water based stains or dyes, there is really no limit, you might even chose to mix and match both types of stains. If you do layer the stains be sure to use the acid stain first and then the dye. Otherwise the acid stain might etch and wash off any water based stain used previously. Use different types of fertilizer with acid stain, as the varying levels of copper and iron/ferrous will leach out and cause speckled and textured coloration. Use color stops like a torn piece of cardboard and then spray a stain so that it follows the torn pattern looking like a vein in marble. Mix and blend various color and use a hair dryer to blow and dry the color into cool custom bleed patterns. If you have questions about concrete stains and additives or need help choosing the right product for your project, the experts at Concrete Countertop Solutions would be happy to help.